Perc Westmore tells a group of interested listeners about the art of arching the eyebrow. Faith Dorn is the model. Nothing spells beauty so definitely as attractive eyes. Never shave your eyebrows. It’s outmoded. As for tweezing, this Hollywood beautician feels that the less tweezed the better. Just nip out those unruly hairs on the lids and then a few along the outer edge of the eyebrow. So much for keeping them well-groomed. If you want to change the shape of your eyebrows or arch them, tweeze the hairs from under the brow, directly above the lid. A new and freshly tweezed eyebrow can do much for milady’s mood. 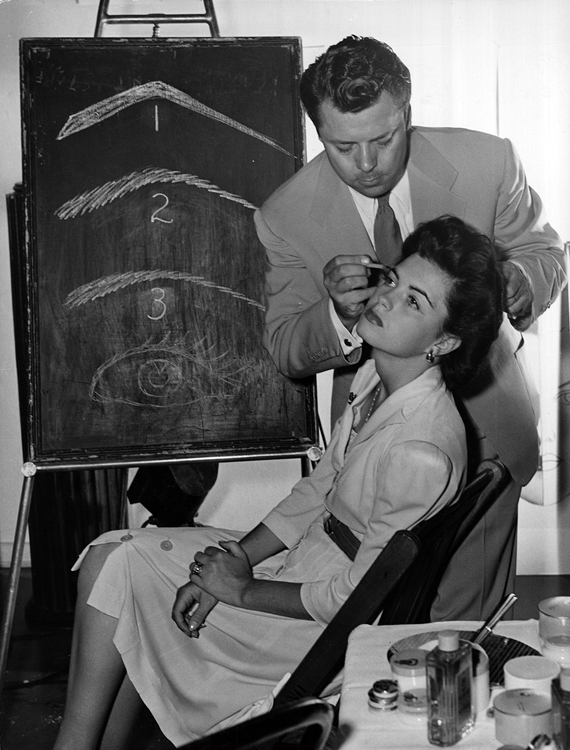 Perc also suggests “eyebrows should be natural – never have sharp lines in your eyebrows”.